Find out about the HSK Chinese proficiency test and how to register for it. We also support the YCT (Youth Chinese Test). Update 17.01.18: 2018 Test Dates! 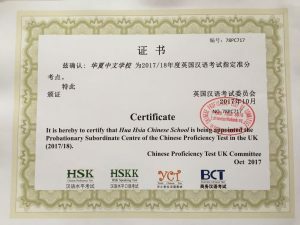 In the last three years, Hua Hsia Chinese School has increased its efforts to raise the profile of Chinese language teaching and learning within a recognised accredited framework, (AQA, Edexcel, CIE, and OCR). Alongside cultural experiences and Chinese Mandarin clubs, more and more schools have introduced Mandarin into their timetable and could achieve International proficiency recognition by choosing to incorporate the Youth Chinese Test (YCT). YCT is an international standardised Chinese language test which is aimed at examining non-native primary and secondary pupil’s abilities to use Chinese in their daily and academic lives. According to the students’ ability, teachers help to choose what level of the test the student would take. YCT consists of two independent parts: the written and oral test. The written test ranges from YCT Levels 1 to 4 and the oral exam comprises the YCT Beginner Level and YCT intermediate Level. On one hand, the Chinese learner may use the proficiency test to understand and measure their language ability and prepare for further study. On the other hand, it is a useful tool for schools to evaluate their teaching. In 2017 CFBL in Kentish Town took part in YCT Testing as part of their Mandarin learning. Hua Hsia Year 2 students will take YCT 1 test in the end of spring term. The HSK (Hanyu Shuiping Kaoshi) test is China’s only official test of Chinese language proficiency for non-native speakers. It is open to foreign students, overseas Chinese, and members of ethnic minority groups in China, and provides the global standard for Chinese language proficiency from beginner to advanced level. It also provides a concrete demonstration of your ability to prospective employers, foreign institutions and other international organisations. The test is administered by Hanban, a non-government organization affiliated with the Ministry of Education of the Chinese government. As of September 2015, Hua Hsia Chinese School is an official YCT & HSK Test Centre for Hanban . The New HSK comprises six levels: • Levels 1, 2 and 3 are entrance-level examinations that correspond to our basic level courses. • Levels 4, 5 and 6 correspond to our intermediate and advanced level courses. Hua Hsia students from year 3-4, will take HSK 1 and 2 exam. Year 5-6 students can take HSK 3 exam. The deadline for registration and payment is one month before each exam. Click here to download our HSK Application Form. The deadline for each YCT and HSK examination is one month before the exam date. Applications received after the deadline will not be processed. As places are limited, early registration is recommended. The precise test time and venue will be confirmed by email at a later date once we have received your registration. In order to register to take the HSK examination level 1 – 6, you need to have your complete registration form and payment. Please send in the form with payment one month before the exam date. Students of Hua Hsia will not need to pay an administration fee. We take external candidates, in these cases an administration fee is required.